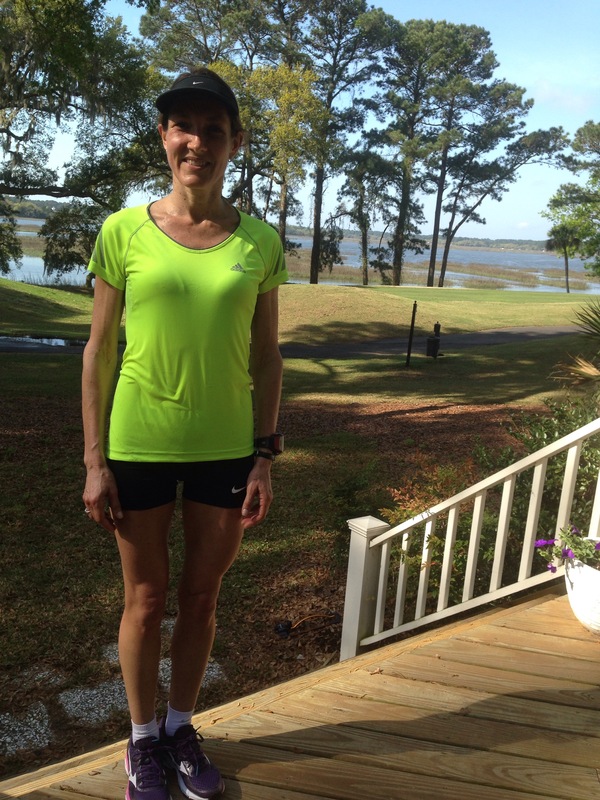 Whilst visiting my Aunt and Uncle, who live on an Island in South Carolina, I needed to tackle a 20 mile long run for my Marathon Training. Factoring in your training when on holiday with family can be tricky. You want to stay cool and not let your obsessive training plan dominate your visit and turn you into an anti-social running bore. Also, it can be pretty tough actually finding long routes. This particular Island is small and so unless I wanted to run the Island loop (which is 3 miles) about 6 times, I needed to try and venture out of their beautiful community and head along the marsh land. I had prepared for the run the night before, taking it light with the the sun downers and heavy on the carb dinner and so physically and mentally I was good to go when the sun rose at 7am. My plan was to slip out and try and get back before I was even missed. Gorgeous morning, but started heating up quickly. Exiting the Island, I got a friendly nod from the security guard. Out on the roads there was very little shoulder and a humming bustle of traffic getting going with their day. I blocked it out and kept steady with my “go-to” mantra, which is basically a series of counting combinations in step with my foot strike. Taking in the wild scenery, my strategy formed as I ran…get to 8.5 miles, then turn around and head back so as not to get lost, then finish off the last few miles on the 3 mile Island loop. The heading back was harder than I expected, the heat was up, I was starting to melt and my water bottle was running low. Dragging my sorry body back through the entrance of the Island, the friendly security guard from a few hours earlier was still on duty and chimed out “You’re my inspiration…yes Ma’am!” (love those polite Southern manners) What a boost that was. I bursted into a huge smile, re-charged my steady speed and finished the last 3 miles with a breezy, happy rhythm. His kind words were just the encouragement I needed. It made me think about how we can all be inspired/encouraged in such simple and natural ways and what a difference it can make to our journey, be that Marathon training or otherwise! I feel so pleased, because finally I have completed a “Happy Long Run.” For several weeks my long runs have been a tremendous slog, a race training duty and something to endure. After my longest run of 24 miles, I knew that I had to somehow create a mental change. During that 24 miles run, I tripped over twice, which indicated a very poor lack of physical control and was gasping for water near the last few miles. In fact , I was so thirsty that as I passed by a catering truck for a film that was happening near the Heath, I desperately asked for water, which they generously provided me with. Once home and showered, and quite zapped of energy, I set to work creating my Just Giving page for the Marathon. 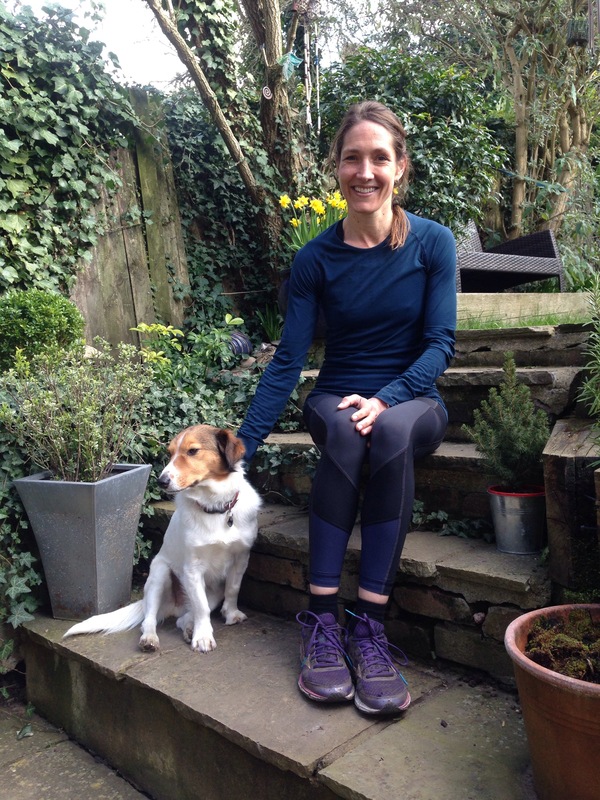 I will be running the London Marathon to raise money for Huntington’s Disease Association, which helps in many practical ways with the challenges of HD. Sadly, this disease has recently touched my family and so this has a personal importance for me. Getting this set and organised has re-charged my motivation and purpose for the task ahead. So now with my training, I can clearly see that there is a point to it beyond the many miles of running. Joyfully, my recent long run of 20 miles was, dare I say, a great experience. I set off with a spring in my step and a clear and determined head. Rather quickly, I found my rhythm and in no time I was zooming around Regents Park with an ease and confidence that I’ve not experienced much recently. The route was one of my favourites that took me past many London areas where I used to live, such as Primrose Hill & Mornington Crescent and so the happy memories came flooding back. The sun was shining and all was right in the world of running. With a contented smile, after 2 hours and 43 minutes, I was back home feeling fine and elated that my Long Run had become HAPPY. Birthday Run- the best run ever! I love my Birthday Run. 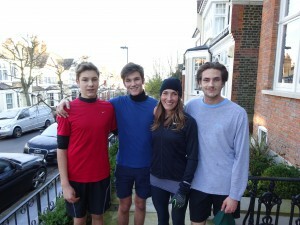 This is the one day of the year when I get my favourite gift of all…a run to the Heath with my boys. There are the usual delay tactics: lost trainers, sore toes (sore head)…any excuse to bail out, but I’m pretty determined with this one as it’s just about the only day of the year that they can’t say no. People are always saying to me that I must have a very fit family with all the focus on exercise in my own life. Curiously, it doesn’t actually work like that- just because running is front and centre in my life doesn’t mean that my family is also mad on running. 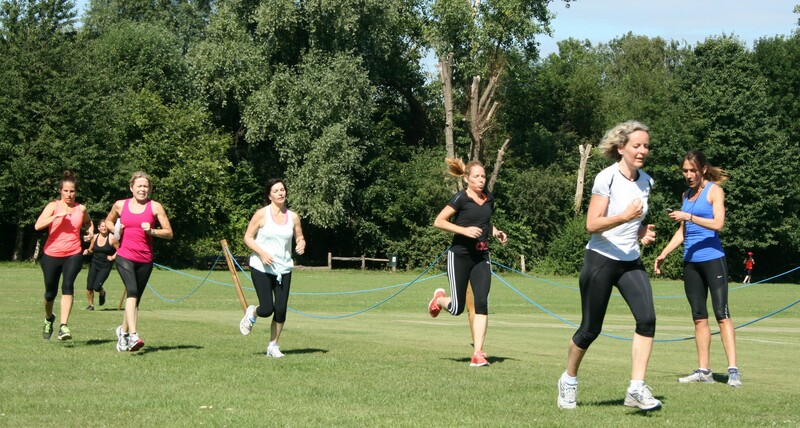 They do like to stay fit and have their own way of doing that, such as gym, cycling, tennis, golf (yes, golf is a sport), however they are not quite as keen on running as myself, which of course I find baffling and yes, I admit it…a little frustrating. When they were younger, I tried all sorts of techniques to get them into running. One summer I started a running jar, where they got a pound coin for each lap of Highgate Woods, with the idea that at the end of the summer they could keep a portion of the money and a portion would go to their chosen sport charity. My intention was that by the end of the summer that they would have established a solid habit of running just because it felt so good! Like most of my hair brain schemes, it didn’t quite work. Often I’d repeat the message, that if you establish a habit of running now, when you are young, then you’ll have it for the rest of your life, which means you’ll have a completely free and fully transportable way of de-stressing and maintaining a strong heart for … ever. However, as a mum, this usually just sounded like a nag to their ears. One day, their “mad for running” gene may gradually surface. For now, I just live for the annual Birthday Run! Week 9 of my London Marathon Training and my plan includes a Half Marathon Race, so I took on the joyful Brentwood Half in Essex. No problem with the pre-race jitters…because of traffic and parking challenges, we were pretty tight with time and so sprinted to the start of the race with just a few minutes to spare. Once we got moving, I settled into my stride, looking at my watch once at the start and then never again as I tried to run on feel, rather than watch pressure. The course was really lovely, with a buzzy, supportive crowd cheering and offering bowls of jelly babies and oranges along the route, making it a fantastic atmosphere. 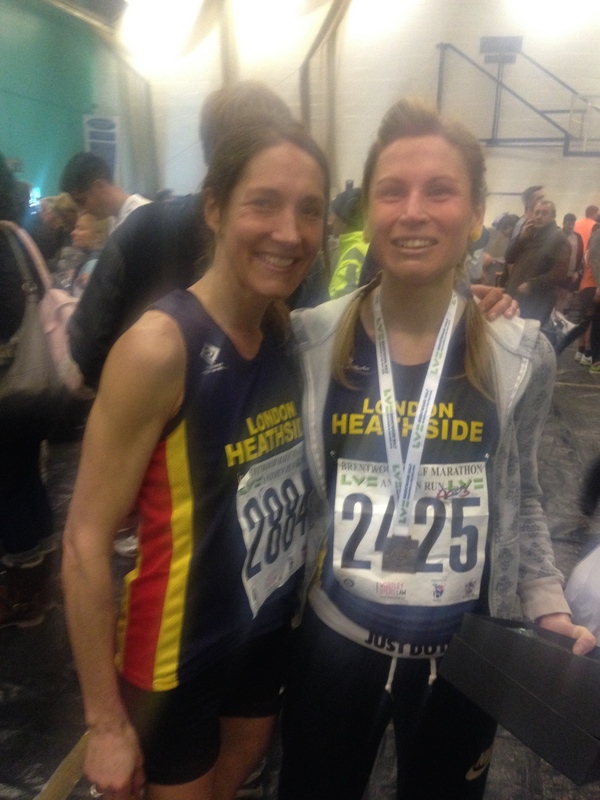 London Heathside Ladies Captain, Cathy Jeremiah (pictured with me), ran a cracking race and stomped it as the 2nd Lady finisher. Running in a slightly different zone, I placed 24th Lady (but first in my age category!!) with a time of 1:35min- decent, but not a PB. After taking on some gruelling distances with my Marathon Plan, (the previous run in week 8 being a 24 mile run), running a Half Marathon, was a welcome treat! T he foundation of Powerwalking is good posture. The spine should be elongated by standing straight, tall and relaxed, whilst tucking your bottom under body and keepings abs engaged. Use gravity to propel you forward with a moderate lean forward from the ankle. Head. Your head should be in a neutral position (chin parallel to the ground), looking neither up nor down. Keep your eyes focused about 15 meters in front of you. Shoulders. Your shoulders should be back and down away from your ears. As you get tired, check to make sure you haven’t started to hunch or shrug your shoulders. Chest. Your chest should be open and lifted from the waist. As you walk, imagine a string attached to the top of your head that’s pulling you skywards. This will keep your back straight and your chest open for optimal breathing. Abdominals . Pull in your abs (think naval to spine) to support your lower back and tighten your bottom. Imagine you are holding a £50 note between the cheeks of your bottom. Contracting your abdominal and pelvic floor muscles levels the pelvis, which helps build strong core muscles. This helps build a flatter tummy and stronger back. Arms. Keep the elbow bent at a 90 degree angle by your side (almost brushing your hips with each step). Your legs will follow the pace set by your arms. It is the back swing that creates the engine with which to drive the quicker leg action. Only bring the hands as far as the chest and move your arms like a pendulum. Try to avoid clenching your fists, which will create tension through the arms, shoulders and chest. Leg stride. Once you have your natural stride length set, you can walk faster by reducing your stride and taking quicker, not longer, steps. Walk as though your legs start from the waist and really extend your legs from the hips. To facilitate the quicker leg movement, it is likely that the pelvis will rotate more at the quicker speed and tight stride width. This is natural. Don’t exaggerate this move as it may strain the lower back. Foot action. Try to land on the heel of your foot and then transfer the weight down the outside of the sole to the ball of the foot. The ankle should be flexed with toes pointed upward at about 45 degrees. As the body’s weight passes over the leading leg, the foot should roll forward and push off from the toes to begin the next step. Really use your toes to push off with to give your step a little more punch. With the quicker leg speed, the toes of the front foot will need to be pulled up to the shin more (dorsiflexion). This prevents the toe dragging as the leg comes through. This extra toe-lift may lead to tension in the shin muscle. Avoid lifting your other foot until the big toe on your forward foot has landed firmly on the ground. The foot placement should be in front of the body, as if almost walking along a straight line. Forward Lean. As you walk quicker, the natural tendency is to lean forward from your ankle (not waist) and the impact is transmitted through the natural curve of the spine. As you lean, gravity pulls you forward and your feet will land underneath you. Breathing. Breathe in rhythm with your stride from your diaphragm, not your chest. Keep it relaxed. Breathe in for two counts through your nose and out for two counts through your mouth. Relax your body and Focus your mind. Keep every part of your body relaxed, except for the abs and bottom which are ‘engaged.’ Focus straight ahead and let the energy flow through your body from your core (body’s centre). Focusing your mind will keep it from wandering and help it relax. T he foundation of great Running is good posture. The spine should be elongated by standing straight, tall and relaxed, whilst tucking your bottom under body and keepings abs engaged. Use gravity to propel you forward with a moderate lean forward from the ankle. Head. The head should be erect, with eyes focused forward to a point on the ground about 15 -20 metres away. Keep your neck soft. Shoulders. The shoulders should be relaxed, square and level. Do not round your shoulders or swing them forwards or backwards. The arm motion should be from the shoulder, not forearms. Arms. Arms should be swinging freely but in a general forward/backwards motion (in a tight figure of eight), not a circle or a straight line. Elbows should be bent approximately 90 degrees with forearms remaining roughly parallel to the ground. The hands and forearms shouldn’t cross over the body as they swing back and forth. Think about taking the elbow back. Hands. Hands are held with the palms facing inwards, not down, in a relaxed fist with the thumb resting in the forefinger. Torso. The torso should be erect, with chest up (open and lifted from the waist) and plenty of room for the diaphragm to move for proper breathing actions. 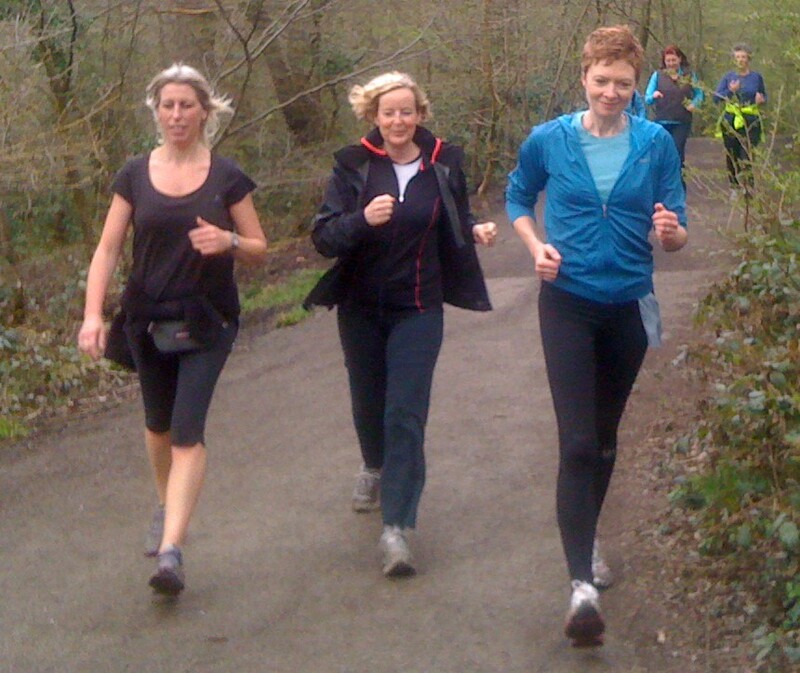 Many runners do have a lean forward slightly from the ankles, not the hips. Do not slouch, for this will put stress on the lower back. Hips. The hips should be steady, square and level with no sideways movement. Legs. The leg action should be relaxed, with pendular movements and moderate knee lift. Legs and arms should move together in a smooth, steady rhythm. Feet. The foot should strike the surface on heel or mid foot (ball of the foot), in a dorsiflexed position (with the toes pointing forwards not downwards) otherwise this creates a “breaking” motion. The foot lands below the centre of gravity – just below the hips. On landing the foot should be “light” not heavy, it then “grips and scrapes” the surface. “Push off” from the ground and let heel float up behind. Knee. The knee is slightly bent on contact with the surface. The knees should point straight ahead, as if they were headlights of a car. Breathing. Keep you breathing relaxed. Breathe from your diaphragm, not your chest. Using a rhythmic breathing pattern (for example breathe in for two counts and out for two counts) throughout your run can help you gain endurance, flow and avoid stitches.